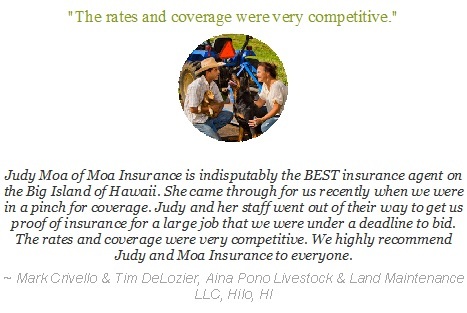 "Why settle for less, when you can have Moa"
Judy Moa has been our insurance agent for our homeowner and business needs for several years now. Even when she has been traveling and we have questions or changes, she responds immediately and always with Aloha. I have met with Judy on several occasions to brainstorm about coverages, even picking her brain about various business strategies. Her advice is always professional, accurate, and most helpful. We would both recommend Judy to anyone searching for the best in the industry.